Destiny is one of those rare games that makes you feel like a kid again. I spent a large amount of my childhood playing video games and ever since I’ve gotten older, it’s not often that I get that same sense of wonder and excitement at what lies ahead in a game. The feeling of not wanting to go to bed because there’s something new to experience, and waking up the next day, immediately wanting to continue on your adventure. It’s rare getting that feeling, but Destiny is able to accomplish just that. I first heard about Destiny in the fall of 2013, and to be honest, I wasn’t that excited. I just saw it as another generic first-person shooter much like the beaten-to-death Call of Duty series, and the fact that it was published by Activision didn’t help my suspicions much. I had no interest in it and didn’t think about it again until eight months later when the beta was released. I thought, “Why not?” and downloaded it; I was blown away. I have never played a beta that well put together with so few issues. It was less like a beta and more like a trial version of the full game. All of the visuals and sounds were astounding, even on a PS3, and the storyline was enticing. Just from the little bit I was given, I knew I would have to play this game again. Hopefully, it would still be just as good. And it was. Even after playing through the beginning of the game once before, it was still just as enjoyable, if not more so, the second time. The premise is that a mysterious, large sphere called the Traveler arrives at present day earth and throws the human race into a 700 year “Golden Age” filled with exploration, technological advancement, and peace. 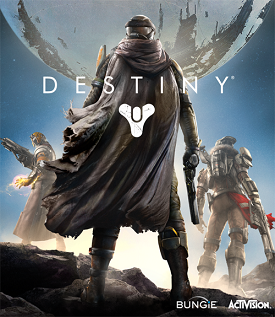 Destiny begins right after “the Collapse,” an event that ended the Golden Age and brought mankind close to extinction. The Traveler is now hovering above the last human-occupied city on Earth, being protected by the Guardians. The Guardians have the ability to wield power given to them by the Traveler, and are using it to fight off the alien races that have taken over Earth and their other colonies following the Collapse. You begin the game being awoken by a robot named Ghost, voiced by Peter Dinklage, who needs you to join the Guardians to help in their fight against the aliens. You accept your role and set out with Dinklebot to explore the solar system and help revive the Traveler. As you play through the game, the story slowly unravels and you learn more about the events that happened leading up the beginning of the game. Although I haven’t completed the game yet (there’s just so much to explore), I have enjoyed what I’ve played of the story. I would highly recommend playing through the game with friends. The overall experience is far more enjoyable when you have a buddy to experience it with. It makes the experience more special and original. One complaint I do have is the game is not set up to have someone not on your friends list easily join a co-op game with you. If you don’t have anyone on your friends list with the game, you’re not getting the full Destiny experience. The visuals were absolutely stunning, and the detail was incredible. While on the moon missions, I noticed that not only was the earth slowly rotating above you, but if you looked through a sniper scope towards the sky, you could see Mars. The controls are tight and responsive. As you pull the trigger back on your controller, the trigger in the game moves at the same pace in real time. When playing as a Titan, one of three classes in the game, you feel like you are actually punching a gross alien monster in the face when you are punching a gross alien monster in the face. The sounds make you feel like you’re really there. The game’s soundtrack was composed by Halo composers Michael Salvatori and Martin O’Donnell and is an experience in itself. Overall, I was very pleased with Destiny and have very few complaints, one of the larger ones being load times, but it makes up for it. It has been one of my favorite games of 2014, and I would highly recommend anyone who might be interested to check it out and consider adding it to your gaming library. Your Destiny awaits.